In recent times, more and more women are choosing to have children at a later age. Often this is a result of having decided to focus on career first, or from not finding the right partner. In fact, women today are having their first baby at an average age of 28.4 years, which is an all-time high, and as a result, there’s a growing demand for social egg freezing. Social egg freezing became a thing for women from around 2012. Essentially it refers to the process of IVF but without an embryo transfer. 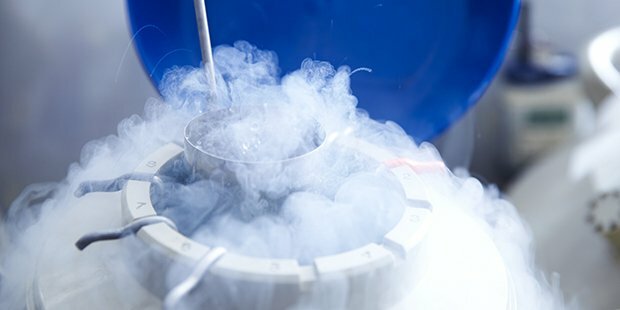 Egg freezing (also known as “oocyte cryopreservation”) may be seen as a way to “safe guard” a woman’s fertility, but it’s not something that should be entered into lightly, despite the fact some Australian companies are even looking into the option of freezing their female employees’ eggs as a way to help them secure their fertility future! What’s involved in egg freezing? Egg freezing requires preliminary tests such as a blood test and an ultrasound scan. To stimulate the growth of the follicles, follicle stimulating hormone (FSH) injections are undertaken on the third day of a woman’s period and these continue for around five days. Following this, a second injection occurs towards the end of the cycle, which is designed to stop eggs from being accidentally released too early. At the optimal time, a nasal spray is then used to induce ovulation. Under local anaesthetic and a vaginal ultrasound, a needle is then inserted to retrieve the eggs, which are then extracted and frozen. The woman will then get her next period in around two weeks’ time. Typically, at least three of these egg freeze cycles are performed. This is recommended in order to give women a realistic chance of conceiving when these eggs are later fertilised to become embryos. Eggs can be frozen for up to ten years, and thanks to today’s embryology advances, the majority of frozen eggs are expected to survive the freeze/thaw process despite how long they’ve been on ice for. What’s the optimal age to freeze your eggs? When it comes to egg freezing, generally speaking, the earlier you do it, the greater your chance of success. For social egg freezing, women aged between 35 and 37 years are considered in the optimal age bracket for achieving the largest benefit over no action, and this also appears to be most cost-effective age for women who do not have any ovarian impairment. Of course, there’s no guarantee of success, despite how many eggs are retrieved. The ovary contains lots of eggs, and each month about 50 of these eggs begin to grow. In a natural cycle, the egg that is the most competent is released. Egg freezing does not use up any “extra” eggs but rather rescues some of the eggs that were never going to be released. This means that not all of the retrieved eggs are going to be of a “useable” quality. So while freezing eggs may, in theory, substantially improve a woman’s chance of conceiving a child of her own when she is of an older age, there are no guarantees that the eggs collected will definitely go on to make babies in the future. Egg freezing can start from $2,000 out of pocket and go from there. Should a woman choose to use her frozen eggs in the future, she can either fertilise them with her partner’s sperm or can use donor sperm. The costs of the thawing, fertilising and implanting the embryos at this point in time is typically around the $4,000 mark. As mentioned, egg freezing is not a surefire way to ensure a woman’s future fertility, but it certainly has the ability to increase her chances of being able to conceive a family in her late thirties or forties. The process is relatively uncomplicated and involves an individual assessment of fertility that often leads to better decisions in one’s current relationship and life choices in general. Egg freezing is here to stay and may even become mainstream in the future, when IVF is likely to become more prevalent, not just as a potential solution for infertility, but as a means of minimising genetic disease transmission to our children. This information has been sourced from Dr Sonya Jessup, BHB MBChB MRM FRANZCOG who is an experienced Fertility Specialist and Gynaecologist at Demeter Fertility.